Since the time of the gladiator, athletes have been revered and celebrated within society. Even today fans gather in masses in sporting arenas and sport bars to route for their favorite teams. The 2016 Rio Olympics provided an opportunity for fans to cheer on their country and the various institutions represented by the athletes. The University of Texas at Austin was represented by 20 current and former student athletes at the olympic games and tied for the seventh place spot with the country of France with the number of gold medals won. The lives of athletes are often glamorized but the reality for collegiate athletes is far from the glitz and glam experienced by professional athletes. Collegiate athletes not only have to maintain rigorous training and conditioning schedules but have to maintain minimum academic requirements in their rigorous academic pursuits. Athletes measure success one victory at a time, but for college athletes the pressure compounds to not only include athletic prowess, but academic performance as well. 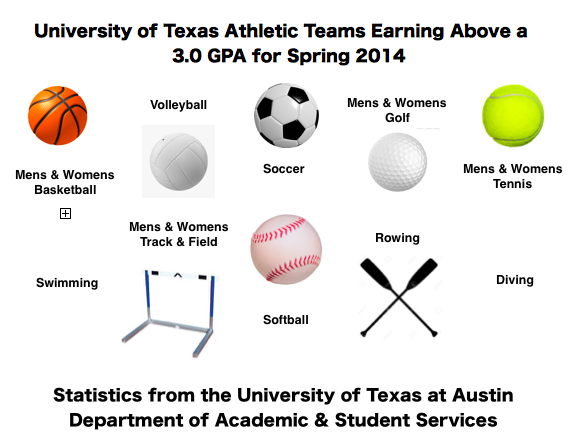 The current average GPA of all student athletes at the University of Texas at Austin is 3.04 with 62 percent of student athletes maintaining a cumulative GPA of 3.0 or higher, according to reports published by the university. The university does not publicize undergraduate GPAs for non-student athletes. UT Athletics Director and former member of the Kentucky State University basketball team, Chris Plonsky, acknowledges the unique personality required to balance college-level athletics and academic pursuits. Plonsky said the qualities that collegiate athletes possess translate to the individual’s ability to be successful in a rigorous academic environment. Even so, the expectations of a student athlete at the university are exceedingly elevated in comparison to those of students not participating in college-level athletic programs. “When you get back home, you’re physically tired and you still have all the work to do that your other classmates have probably already done,” senior mechanical engineering major and UT track athlete Carlton Anumnu said. 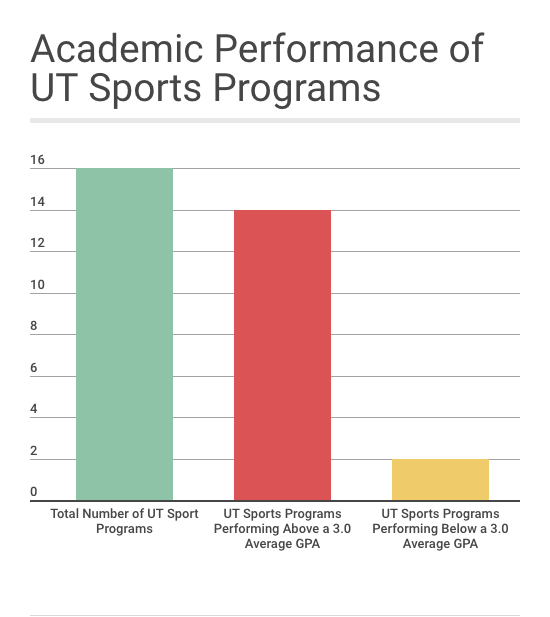 In order to participate in athletic programs at UT, students must be enrolled as a full-time student, meet a minimum GPA requirement, attend mandatory study hall hours, complete community service hours, and attend team practices and individual conditioning sessions. Despite theses demanding requirements student athletes must meet, stereotypes and misconceptions about them run rapid. “I think some common stereotypes and perceptions of student athletes are that they’re kind of crazy, they party a lot, they’re entitled, they’re more into the sport than school and their education,” Victoria Recer, a senior english major at UT, said. “I know a lot of athletes, I’m friends with a lot of athletes, and they’re usually the most academically driven,” senior journalism major Katie Sampson said. According to Plonsky, the truth of the matter is that student athletes and non-student athletes work equally as hard for their “highly coveted” position at UT. “Everyone works hard to get here, nobody was given a position at this university,” said Charles Anumnu. 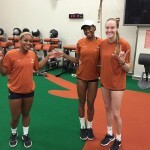 And while Carlton Anumnu, Charles Anumnu and Chloe Collins are grateful for the opportunity to represent UT with their athletic abilities, the trio cannot help but wonder what it would be like to be a normal college student. For some student athletes, balancing their time between academics and athletics can become a challenge, which causes some of them to leave the program. Plonsky said that the number of students that leave the athletic program at UT is low, but that it does happen. One such student, Rachel Thomas, a senior public health major, ran track her first year at UT. Thomas realized the difficulty of her major and made the decision to resign from the track team toward the end of the season her freshman year. “I felt I was a stronger student,” Thomas said. For the strong-willed students who do choose to pursue collegiate athletics and academic pursuits simultaneously, collegiate athletics often serve as a way for the athletes to access and finance their collegiate studies. According to the NCAA, only about 3.5 percent of collegiate athletes turn pro and many student athletes understand that their competitive athletic careers will come to an end after graduation. Courtesy photos shot by Jordan Larkins and screen-grabs provided by Chloe Collins. Chloe Collins, a fourth year Communication Studies student-athlete, poses with teammates after a weight lifting session. 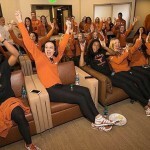 Chloe Collins, a setter for Texas Volleyball, rejoices with teammates before watching a film. Spencer McCloud, along with his teammates, warm up their legs before an afternoon practice. Spencer McCloud, a track and field student athlete, warms up before practice. Spencer McCloud poses for a photo during practice.